Jenny O. will be playing a string of West Coast tour dates starting this week. Kicking off the first leg of the tour this Thursday August 25th at the Warfield in San Francisco, Jenny will be supporting two time Grammy Award winner Ben Harper. Jenny O. will also be joining Rock & Roll Hall of Fame inductee Leon Russell for a set of additional dates in Arizona and California in October. 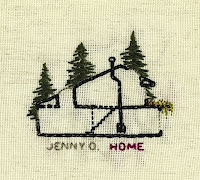 Jenny O. recently released her debut CD Home on Manimal Vinyl to impressive press accolades. Home features 5 folk inspired tracks with piano and country-style guitar picking. Jenny O. delivers each song with a warm yet quirky vocal styling reminiscent of Joanna Newsom and with a touch of vintage 60's pop arrangements.